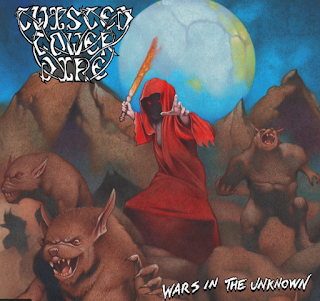 Lyric video: "Light the Swords on Fire"
Album: "Wars in the Unknown"
Δελτίο τύπου: «TWISTED TOWER DIRE was formed in The Washington D.C. suburbs in the early 90’s as a result of the members’ dissolution with the music of the times; they wanted to play classic style heavy metal! Early successes include two albums released on The Miskatonic Foundation label (‘The Curse of Twisted Tower’, ‘The Isle of Hydra’) and a European tour including an appearance at Wacken ’99. In 2003, the band their 3rd album ‘Crest of the Martyrs’ produced by Piet Sielck (IRON SAVIOR, BLIND GUARDIAN). This release was followed by a second European tour and second appearance at Wacken in that year. The band continued to perform live shows on the East Coast and Midwest of the US and released their 4th album 'Netherworlds' in 2007. That same year, longtime vocalist Tony Taylor left the band and was replaced by Jonny Aune. Soon after the band traveled to Europe again to perform at the Keep it True festival in Germany with additional shows in Ireland and Greece. Tragedy struck three years later, when Tony Taylor died in a tragic motorcycle accident. The band dedicated their next album ‘Make it Dark’ (2011) to his memory. HEAVY METAL THUNDER 31 Ιανουαρίου 2019 - 3:10 μ.μ. Ωραία νέα. Γαμάτα μπαίνει το 2019! BALADEUR 3 Φεβρουαρίου 2019 - 3:10 μ.μ.